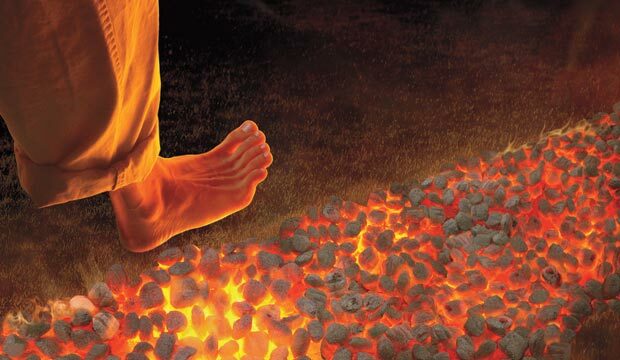 A daring dash across hot coals creates harmony in the heart-rate pattern of the person striding barefoot and that of friends and relatives watching, suggesting that emotional connectedness can manifest itself physically. During a fire-walking ritual in the Spanish village of San Pedro Manrique, scientists strapped heart-rate monitors to 38 people: 12 about to walk the 23-foot swath of coals, 9 of their friends and relatives, and 17 unrelated spectators. As the walkers made five-second strides across oak embers glowing at 1,251°F, their heart rates synchronized with those of their relatives and friends, but no correlation was found between participants and unrelated spectators.